A workshop on "Industrial and Systems Engineering and Healthcare: Critical Areas", held in 2009 was co-sponsored by the NSF and the Agency for Healthcare Research and Quality. It envisioned an ideal health care system that is unlike today's fragmented, loosely coupled, and uncoordinated assemblage of component systems. The workshop concluded that, "An ideal (optimal) health care delivery system will require methods to model large scale distributed complex systems." Our research objective was to develop such methods. 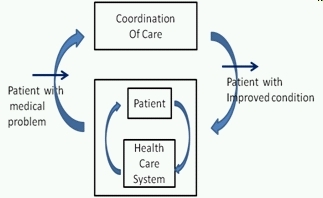 As illustrated in the Figure (Care Coordination Model), we visualize an "as is" health care system in which a patient is treated for a medical problem and emerges with a, hopefully, improved condition. Coordination is shown as an additional component that identifies the various community partners involved in health care and rigorously lays out how their interactions are more effectively coordinated to improve the care that a patient receives and consequently, the quality of the outcome. The most cost effective care aims to treat the neediest patients that cost the most. Flexible to meet variety of stakeholders' interests and variety of accountable care implementations. Scalable to accommodate increases in scope, resolution and detail. Integrate system of system concepts system, components, and agent concepts extended to human behavioral limitations. Enhance Electronic Medical Records and Health Information Technology systems as needed to support coordinated care. Support services based on model, e.g., patient tracking, medication reconciliation, etc. The Pathways Community HUB Model is a model of care coordination that was developed by the Ohio Community Health Access Project (CHAP) in Richland County to improve health and preventative care for high-risk mothers and children in difficult-to-serve areas. In order to focus model development and to enable data access for calibration and validation, CHAP agreed to work with us as the test bed for our model development. In this regard, CHAP agreed to provide access, under suitable data sharing agreements, to its data base of client and pathway records. This provided an instance of the Pathways Community Care Coordination framework as a basis for our systems-level simulation model. In the initial phase, our objective was to construct and validate the model when applied to high-risk mothers and children in difficult-to-serve areas following the CHAP coordinated care pathways for the case of successful normal birth outcomes. We collected de-identified personal health and behavioral data (such as demographic, socio-economic, etc.) for successfully and unsuccessfully treated clients from the EMR data base employed by CHAP. As with earlier studies, we encountered data quality problems. Overcoming these issues lead us to development of specific metrics and tools to assess data quality and maximize its usefulness. Consulting with the CHAP participants in the project, it became apparent that the metrics and tools developed would be useful to implementations of the Pathways model independently of their use in our data analysis. We also realized that these tools would enable us to compare output of the model to be developed with actual CHAP data at a more in-depth level and more extensively than initially contemplated. See Formalization of the Pathways Model Facilitates Standards and Certification for an overview of the new insights into the Pathways Community HUB Model that will inform the design of the model's certification program currently under development. For a discussion of the integrated approach to health care systems under developent based on this research please play the first and second videos at the bottom of the page. This page provides access to PathwayTools.java which you can run in MS4 Me using the two data spread sheets to obtain results of the same nature as those presented in the report (the data sheets have been modified to randomize the relationships). PathwayTools.java uses methods from the Analytics plugin developed for this project. You can look at the imports section of the code to see how to access this plugin.